MAIL CALL: The Letter "E"
I printed out an E in a fun font. I traced the letter "E" on Steam a Seam 2 and fused it to a scrap of fabric. I fused the letter to another scrap of fabric and I added some Tearaway Stabilizer behind the fabric, threaded my handy-dandy Handi Quilter Stitch 210 machine with Cabana Fabulux Thread in the needle and DecoBob in the bobbin. MAIL CALL: The Letter "U"
I printed out a U in a fun font. I traced the letter "U" on Steam a Seam 2 and fused it to a scrap of fabric. I fused the letter to a scrap of fabric and I added some Tearaway Stabilizer behind the fabric, threaded my handy-dandy Handi Quilter Stitch 210 machine with Neon Lime FabuLux thread in the needle and DecoBob in the bobbin. MAIL CALL: The Letter "M"
I printed out an M in a fun font. I fused the letter to a scrap of yellow fabric and I added some Tearaway Stabilizer behind the fabric, threaded my handy-dandy Handi Quilter Stitch 210 machine with Neon Lime FabuLux thread in the needle and Sage DecoBob in the bobbin. For the record, all of those tight curves were a bit fussy to stitch around. I sent the card off in a clear mailing envelope and am now planning which letter to make next. Any suggestions? Cutie Quilt: Going My Way? Going My Way? is one of my early Cutie Patterns and I'm so tickled to have made this new sample! I need to make another one of these soon. Hmmm..... which fabric should I choose next? MAIL CALL: The Letter "A"
Let's start at the very beginning. I'm making a series of fabric postcards for a special little boy. Last week I made him the letter "S" and this week I started at the beginning of the alphabet. I printed out an A in a fun font. I traced the letter "A" on Steam a Seam 2 and fused it to some funky turquoise fabric. I fused the letter to a scrap of yellow fabric. I added some Tearaway Stabilizer behind the fabric, threaded my handy-dandy Handi Quilter Stitch 210 machine with Blue Heaven FabuLux thread in the needle and Gray DecoBob in the bobbin. I fused some scrap backing fabric, Peltex, and my top fabric together. Then I trimmed the card to 4 1/4" x 5 1/2". It was a quick project! I turned the project over to Grandpa who wrote a silly note and we packaged our gifts into a clear mailing envelope. Which letter should we make next? I recently taught a Summer's End workshop for my local quilt guild. At the last meeting, several of my students brought in their finished quilt tops. All of my students did a great job. I can't wait to see the rest of the quilts as they are finished! 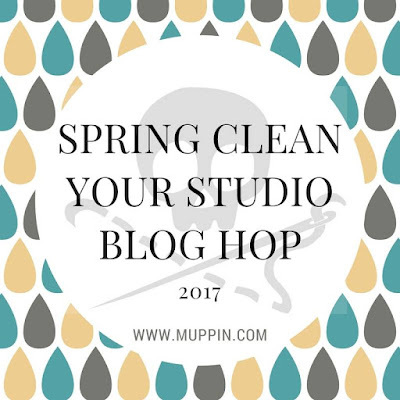 I'm so excited to be involved in the Spring Clean Your Studio blog hop again this year! I've been working hard on improving my studio space this year. This is only the thread that's on display. There's so. Much. MORE! I love my design wall more than I can possibly express. I'm a high-volume quilter and I have been for many, many years. I make a lot of samples of my Cutie Quilt Patterns. I make a lot of quilts as gifts. I make a lot of charity quilts. 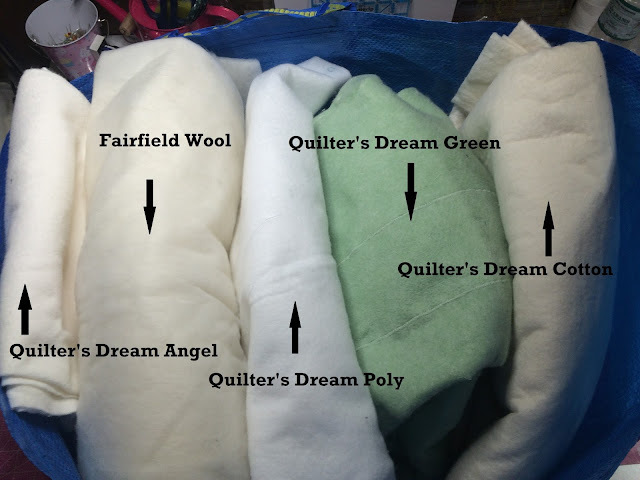 I have developed systems to deal with my fabric scraps and I'm 80% (ok, 75%) on top of them. But there are other scraps produced by high-volume quilters -- batting scraps! I use many types of batting and have bags of leftovers in various locations in my sewing room. I try to join my scraps by hand stitching, machine stitching, or fusible tape and use the "Franken-batts" in charity quilts. A few years ago I started sorting my batting scraps by type, but then I ended up with a bag of wool scraps, a bag of cotton scraps, a bag of polyester scraps, etc. The bags were taking over! Pet beds to the rescue! I sorted through my scrap bags of battings and filled several pet beds with the small pieces. The animal shelter is happy, and so am I.
I hope to keep making pet beds from my batting scraps so that my batting always fits into one IKEA bag. I now store that single bag under Sergio, my suave and debonair Handi Quilter Simply Sixteen. But what shall I do with all of the empty bags? Thanks for visiting my studio today. Check back daily for my Spring Cleaning inspiration! A few weeks ago, Moda Bake Shop tempted me with their Spring Along Charm Quilt pattern. I tried to resist, but resistance was futile. My local quilt guild sent out an email asking for quilts for teen boys at the local children's home, so this quilt will be sent to love on a teen who lives there. 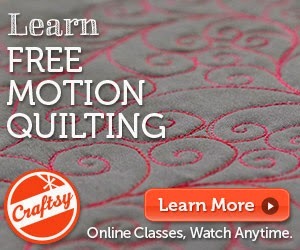 *Coupon Details: Get 50% off the full retail price of select Craftsy classes taught by Debby Brown - Instructor. Cannot be combined with any other coupons. Expires July 18, 2017. MAIL CALL: The letter "S"
I solemnly swear I am up to no good. I had an idea to send some love through the mail in the form of fabric postcards. I enlisted my husband to help with this project since we are both rather fond of the intended. I printed out the alphabet in my desired font. I traced the letter "S" on Steam a Seam 2 and some black and white scrap fabric. Then I fused it to some green leftover from another project. I added some Tearaway Stabilizer behind the fabric, threaded my handy-dandy Handi Quilter Stitch 210 machine with Lime Green FabuLux in the needle and Sage Green DecoBob in the bobbin. I tore away the stabilizer and fused some scrap backing fabric, Peltex, and my top fabric together. Then I trimmed the card to 4 1/4" x 5 1/2". Someone (cough*Grandpa*cough) wrote a silly sentence of "S" words and we packaged our gifts into a clear mailing envelope. I've decided that I need to make more Go With The Flow Cutie quilts. It pieces up so quickly and looks much more difficult than it is. This was a Christmas present for a special young lady (don't look at the current date, and if you do -- DON'T JUDGE ME!). My daughter's friend named the pattern for me and loves this Thicket fabric. This quilt was the perfect quilt for her! I finished the quilt, let her know the quilt was finished, left town , and when I returned the quilt was GONE! Be careful, quilt thieves are everywhere. Especially when your daughter routinely does her laundry at your house. Quilting is my livelihood. Many are jealous because they think that I make quilts all day, every day. While I do quilt a lot, it is always on a deadline. I also spend a great deal of time in airports, airplanes, cars, and at my desk. The time spent at my desk is the cruelest time. My desk is in my sewing room and I can see fabric, but I don't get to touch it while I am working on contracts, travel arrangements, handouts, lesson plans, social media, blog posts, magazine articles, and the like. Please don't think I'm whining. I love my job and accept easily the less-than-thrilling aspects of it. Until May. Quilt Market is in May and many industry professionals are a little stressed out right now as we prepare for this twice-a-year trade show. I'm stressed. I'm spending ridiculous amounts of time sitting at my desk these weeks and often gaze at the ceiling trying to think of the word I want to type. I can never remember why I went into the kitchen and often forget the word I want to use next (Keeping it real, folks). I see far too much of my ceiling and decided that it needed a little sparkle and fun to help me get through the next few weeks. Who can have a bad day when there's a disco ball?